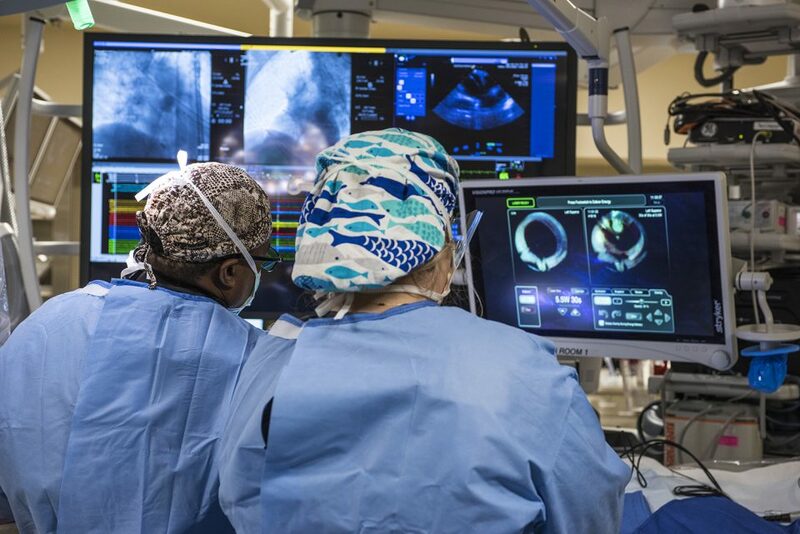 Performing the first laser ablation procedure for atrial fibrillation (AFib) in the state of Colorado, the Heart & Vascular Center at Valley View continues to offer the most comprehensive and innovative treatments available for the management of atrial fibrillation in the Mountain West region. Over 2.7 million people in the United States suffer from AFib, and those numbers continue to climb with an aging population. Afib has a higher than average prevalence in western Colorado because of the high altitude. One of the modifiable risk factors of Afib, sleep apnea, occurs more frequently at higher elevations. Afib occurs when rapid, disorganized electrical signals cause the heart’s two upper chambers to beat very fast and irregularly. In addition to the uncomfortable symptoms, if left untreated, AFib can lead to blood clots, stroke, heart failure, and other heart-related complications. Dr. Frank Laws, (Hybrid Cardiovascular Specialist: Electrophysiologist, and Interventional Cardiologist), and Medical Director of the Heart & Vascular Center, was first exposed to laser ablation procedures in Europe, prior to the procedure’s approval here in the US by the FDA in 2016. He recognized that once approved by the FDA, the ability to perform laser ablations would add to the menu of options that electrophysiologists could offer in treating patients with atrial fibrillation. While commercially available in Europe, currently only a very small number of facilities across the US have the ability to perform a Laser ablation for AFib. For patients who have not had success with medication or other ablation techniques to control their AFib, laser ablation represents a new opportunity to correct what can often times be a debilitating and life threatening problem. “Patients who have had an ablation procedure in certain parts Europe over the past 18 to 24 months, most likely had a laser ablation,” says Dr. Laws. He suspects many US cardiac programs will adopt the new technology due to its success rate in treating AFib, which data suggests has an 80 to 90 percent success rate. “Right now we (the Heart & Vascular Center) are ahead of most major urban medical centers who are going to get their lasers installed sometime later this year,” he shares. Ablation works by scarring tissue in the heart to disrupt the faulty electrical signals causing the irregular heart rhythm. For years, radiofrequency ablation has been the gold standard of treatment, but without the ability to actually see the lesions created during the procedure, there has been an increased chance of leaving behind residual channels that were not completed ablated. More recently, cryoablation was introduced as an alternative treatment option, with a similar set of limitations. “The benefit of laser ablation is that I can literally visualize each ablation lesion as its being created inside the heart. I can also see all other related internal structures, allowing us to avoid unnecessary complications while ensuring that the ablation procedure is done with increased accuracy”.